In enjoying a beautiful sail aboard The Liberté, you can also enjoy views of two iconic coastal cities: Annapolis and Cape Cod! In enjoying a beautiful sail aboard The Liberté, you can also enjoy views of two iconic coastal cities: Annapolis and Cape Cod! With one boat and two beautiful cities to enjoy throughout the season, there are plenty of opportunities to go on an adventure and see beautiful sights of these quaint and picturesque locations! As you plan your next adventure for the upcoming year, consider your options for sailing the coastlines of these two beautiful cities in 2019! Sailing is the perfect way to get outside and enjoy a summer day. Why not plan an exciting day of fun for your family in 2019? With daysails available in both Annapolis and Cape Cod during the 2019 season, there is plenty of time to spend a beautiful day on the water with your friends and family. From children to adults, a sail aboard The Liberté is a fun and exciting experience for everyone on board. Book a beautiful day of sailing along the Chesapeake Bay in Annapolis, Maryland next year. As you are sailing along Maryland’s tiny capital city, you will be able to enjoy views and colorful photo opportunities against the backdrop of the United States Naval Academy, the Chesapeake Bay Bridge, and the Thomas Point Lighthouse. Not only will your family be able to enjoy views of the bay, but you can also explore the beautiful sights of the Severn River on your sail! 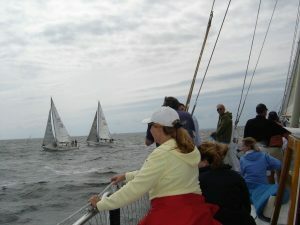 What better way to explore the best of Falmouth, Massachusetts than with a fun and exciting sail around Cape Cod? Start your sail overlooking the Vineyard Sound of Martha’s Vineyard, and enjoy the colorful and historical sights of Cape Cod along the way! With plenty of picturesque views, including colorful New England coastal cottages and lighthouses, you and your family can enjoy beautiful sights of Cape Cod from the water. Plan Your Next Adventure with a Sail Aboard The Liberté! This entry was posted on Friday, November 16th, 2018 at 10:38 am. Both comments and pings are currently closed.